When Bharatha set out to his uncle’s house, he took with him the sinless Shatrugna, the killer of foes. This is the end of the first chapter Of book ofAyodhya of the holy Ramayana composed by Valmiki as the first epic. The king who was the lord of men, with a deep , loud , attractive ,rumbling and incomparable voice which was like the sound of a drum and rumbling of a cloud addressed the kings and said. This is the end of the second chapter Of the book of Ayodhya of the holy Ramayana composed by Valmiki as the first epic. That king seeing his saluting son near him , drew him near , holding his folded hands and hugged him. This is the end of the third chapter Of the book of Ayodhya of the holy Ramayana composed by Valmiki as the first epic. This is the end of the fourth chapter Of the book of Ayodhya of the holy Ramayana composed by Valmiki as the first epic. That nurse maid bursting with great joy told the hunchback about the luck of Rama with greater joy. This is the end of the seventh chapter Of the book Ayodhya of the holy Ramayana composed by Valmiki as the first epic. “Kausalya whose son is going to be crowned tomorrow as Yuvaraja in the Pushya star is indeed lucky. This is the end of the eighth chapter Of the book of Ayodhya of the holy Ramayana composed by Valmiki as the first epic. This is the end of the tenth chapter Of the book of Ayodhya , of the holy Ramayana composed by Valmiki as the first epic. 11.Kaikeyi asks her two boons. This is the end of the eleventh chapter Of the book of Ayodhya of the holy Ramayana composed by Valmiki as the first epic. 12. The shattered Dasaratha requests Kaikeyi to reconsider. After seeing all this Kaikeyi became silent and did not give any reply to the king who was wailing . That king hearing the inauspicious boons asked by Kaikeyi about Rama’s banishment to the forest and the very wealthy life of Bharatha , due to great sorrow did not talk to Kaikeyi for a long time. This is the end of the twelfth chapter Of book of Ayodhya of the holy Ramayana composed by Valmiki as the first epic. This is the end of the thirteenth chapter Of book of Ayodhya of the holy Ramayana composed by Valmiki as the first epic. This is the end of the fourteenth chapter Of the book Ayodhya of the holy Ramayana composed by Valmiki as the first epic. 15.Sumanthra goes to Rama’s palace. This is the end of the fifteenth chapter Of the book Ayodhya of the holy Ramayana composed by Valmiki as the first epic. This is the end of the sixteenth chapter Of the book Ayodhya of the holy Ramayana composed by Valmiki as the first epic. 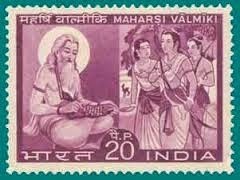 This is the end of the seventeenth chapter Of the book Ayodhya of the holy Ramayana composed by Valmiki as the first epic. Having seen very rarely this appearance of his father, Rama was scared as if he has stamped a serpent . Depressed and extremely sad Rama with a face of diminished luster , after saluting Kaikeyi asked her. After hearing these words which hurt, Rama never felt any sorrow but the king was greatly pained to see the calamity which fell on his son. This is the end of the eighteenth chapter Of the book Ayodhya of the holy Ramayana composed by Valmiki as the first epic.